When you fast, anoint your head and wash your face, so that you may not appear to others to be fasting, except to your Father who is hidden. And your Father who sees what is hidden will repay you. We begin the season of Lent with the same Scripture readings each year, in which Jesus teaches about almsgiving, prayer, and fasting. We often share with family and friends what we are “giving up” for the next forty days to give ourselves more time and clarity for God. Many children choose to fast from chocolate. Some brave adults pick coffee. More than a change in habits, Lent calls Christians to a radical and lasting turning of hearts – a conversion. The traditional Lenten practices of prayer, fasting, and almsgiving are to be part of the Christian life during every season, but during the season of Lent, we are invited to renew our commitment and start afresh. The journey of Lent can be difficult – a time of repentance, of giving up things that tie us to this world and looking instead to the life and teachings of Jesus. But when we courageously examine within, name what is broken within us, turn away from it, and turn toward what is truly good, we will find ourselves living the fullness of life that God wants for each of us. The life and teachings of Jesus help us understand what the fullness of life looks like: love, inclusion, forgiveness, mercy, sacrifice – and nonviolence. We invite you to spend the six weeks of Lent reflecting on Scripture and the six principles of nonviolence as defined by Dr. Martin Luther King. Each week, this guide offers suggestions for prayer, fasting, and action as well as stories from Maryknoll Missioners in communities on the margins around the world. “Like Dr. Martin Luther King, these women discovered, while living through the actual experience of protest against structures that offered them nothing but misery and even death, that nonviolence is more than the approved method for change; it is a commitment to a way of life and a light in the darkness. With nonviolence, we each can be a light today." What do you want to turn away from and toward this Lenten season? How do you respond to the invitation to a philosophy of nonviolence - a new path? so that peace can reign in our hearts. lead us to a version in actions. incarnate the power of Gospel nonviolence. peace, and from loneliness to joy. Turn off anything that supports violence on TV, movies, and the internet. Grow in peace with yourself by fostering a spirit of gratitude instead of focusing on disappointments. “Among the Ilocano in the northern part of the Philippines where I come from, we greet each other with "Adda kayo," which literally translates to, "You are here." It also means, "I acknowledge your presence." When responded to with a yes, a nod, or a smile, the initial greeting would be followed by: "Naimbag met ta adda kayo." "It is good that you are here." The greeting speaks of appreciating, honoring, and valuing one another. 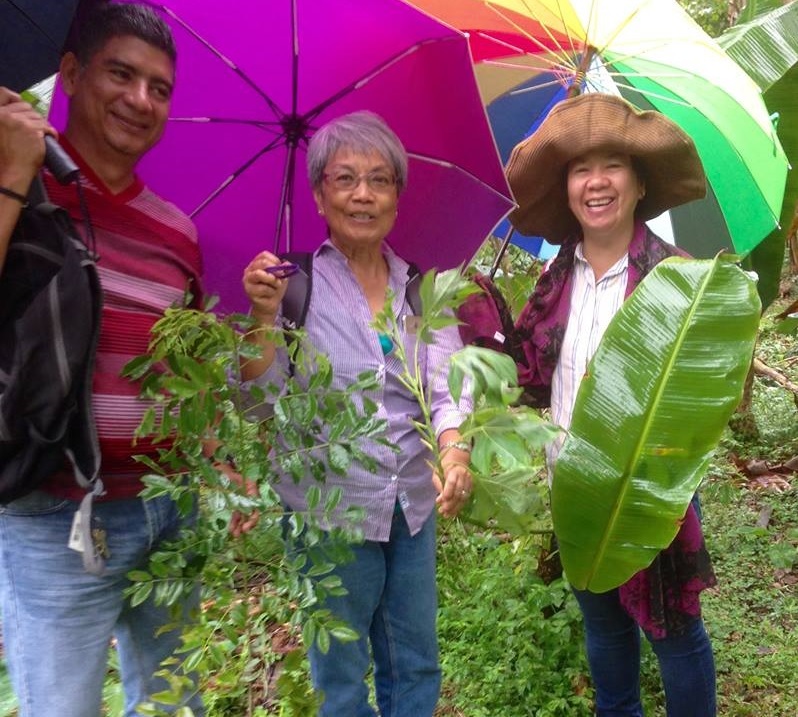 Pictured center, with Sister Nena Heramil , MM (right) at permaculture farm in Panama. Photo courtesy of Sr. Macugay.